Road studs are commonly known as highway studs or railways studs or highway markers.Road studs are a type of traffic safety product fixed in the middle of lane lines or yellow double-line for, through its retro reflection, reminding drivers to drive their vehicles along with the lanes. Epoxy resin installation method is normally adopted generally for installation of road studs. Two component road stud epoxy adhesive is usually used. Part A and Part B should be mixed thoroughly. To avoid wastage do not mix more epoxy than what will be required in the next 25 minutes (i.e. start with 1 liter only). 8 to 10 studs can be installed per liter of epoxy. 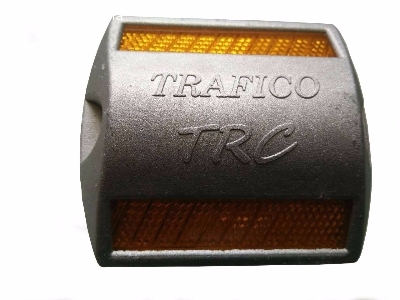 Trafico TRC aluminium road stud with Double Amber reflector market and sale by Flexijoint Industrial Marketing & Services, Kuala Lumpur, Malaysia. For further enquiry, please contact us at T: +6 03 79541136 M: +6 016 3111313 F: +6 03 79808259 E: flexijoint.ims@gmail.com.